Got $6,000 to spend on a pack of lenses for your Canon or Nikon? You'll be wanting to protect them from bumps and scrapes, so Carl Zeiss has generously chucked in a suitcase, too. While there are five lenses in the set—a Distagon T* 2,8/21; Distagon T* 2/28; Distagon T* 2/35; Planar T* 1,4/50 and Planar T* 1,4/85—there's a sixth lens-hole just waiting for you to add to the collection. OBERKOCHEN/Germany, 05.04.2011. During the NAB Show in Las Vegas from April 9-14, 2011, Carl Zeiss will introduce an attractive bundled lens set offer for its SLR lenses. The set contains the following lenses with F (ZF.2) or EF bayonet (ZE): Distagon T* 2,8/21, Distagon T* 2/28, Distagon T* 2/35, Planar T* 1,4/50 and Planar T* 1,4/85. This offer is a response to the strong demand from the HD Video segment for lenses with precise manual focus. With this offer Carl Zeiss supports filmmakers and still photographers entering the booming HD video market with the right equipment that meets their needs. "Many production budgets don't justify investing in a set of cinematography lenses right away, like our Compact Prime CP.2 lenses. Our SLR lenses with their precise manual focus are a reasonable alternative for getting started in HD video," said Michael Schiehlen, Director of Sales for the Camera Lens Division of Carl Zeiss AG. Schiehlen stressed the benefit of these lenses for videography over lenses with autofocus. "Our SLR lenses feature an outstanding manual focus mechanism, so the precision when focusing is far higher than with a manually operated auto-focus." In addition, SLR lenses by Carl Zeiss are robust, offer a high aperture speed, and feature an especially harmonious rendering of the bokeh (the out-of-focus area). The five lenses come in a special waterproof case (IP67), custom-made for this set and feature openings for six lenses. 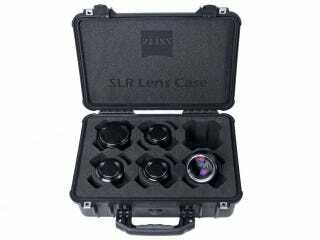 As common for photography lenses, each Carl Zeiss SLR lens has a different size and weight. Therefore a special inlay ensures that each lens fits perfectly inside the suitcase and protects the lenses from shock and vibration. The new SLR lens set will be offered at a recommended retail price of €4562 ($6063), excluding VAT, and will be available starting May.